This guide follows a logical structure. I start by analyzing the business model of a company, I then apply a business model essence to it, and we then look at either why a company adopted a certain business strategy and what’s next. Is business strategy the same thing of a business model? What is a business model essence? Is business strategy a science? Put succinctly, business model refers to the logic of the firm, the way it operates and how it creates value for its stakeholders. Strategy refers to the choice of business model through which the firm will compete in the marketplace. Tactics refers to the residual choices open to a firm by virtue of the business model that it employs. A business strategy is a deliberate vision to get toward a desired long-term goal. A business model is a great tool to execute a business strategy. Yet while achieving a long-term goal a business strategy set a vision, mission and value proposition that can be executed through several possible business models. When one of the drafted business models encounters the favor of the market that is when a business strategy becomes successful! 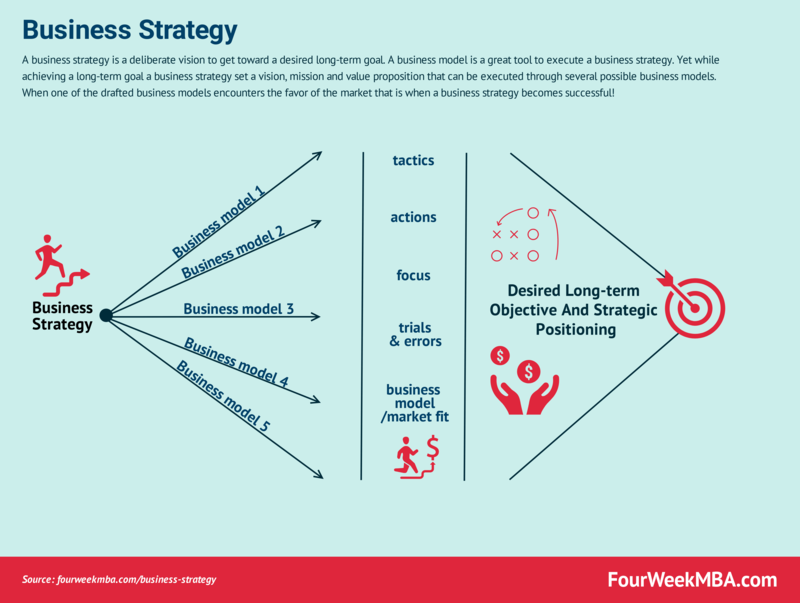 A Business Model Essence according to FourWeekMBA is a way to find the critical characteristics of any business to have a clear understanding of that business in a few sentences. That can be used to analyze existing businesses. Or to draft your Business Model and keep a strategic and execution focus on the key elements to be implemented in the short-medium term. Therefore, for that sake of this discussion, you’ll find for each company’s business strategy, a business model essence that will help us navigate through the noisy business world. From there we’ll see what the business strategy of a company. Business strategy is more of an art than a science. In short, a business strategy starts with a series of assumptions about how the business world looks like in a certain period of time and for a certain target of people. Whether those assumptions will turn out to be successful will highly depend on several factors. For instance, back in the late 1990s when the web took over, new startups came up with the ideas of revolutionizing many services. While those ideas seemed to make sense, they turned out to be completely off, and many of those startups failed in what would be recognized as a dot-com bubble. While at hindsight certain aspects of that bubble came up, which highlighted aspects of the bubble (like frauds, or schemes), in general, some of the ideas for which startups got financed seemed to be visionary. For instance, some startups tried to bring on-demand streaming on the web (which today we call Netflix, one of the most successful tech companies). The problem is those ideas proved to be too early to prove successful. They made sense but from the commercial standpoint, they didn’t. Thus, if we were to use the scientific method, once those assumptions would have proved wrong in the real world, we would have discarded them. However, those assumptions proved to be wrong, in that time period, given the current circumstances. Therefore, while we can use the scientific inquiry process in business strategy, it’s hard to say that it is a scientific discipline. As a practitioner, someone who tries to build successful businesses, I don’t need to be “scientific.” I need to make sure not to be completely off track. For that matter, I aim at creating businesses. Those ideas will become a business model, that executes a business strategy. This doesn’t mean those ideas, turned into a business model, pushed into the world will always be successful (profitable). As the marketplace evolves I will need to adjust, and tweak a business model to fit with the new evolving scenarios, and I’ll need to be able to “bet” on new possible business models. Survivorship bias is a phenomenon where what’s not visible because extinct isn’t taken into account when analyzing the past. While we analyze the past based on what’s visible today. This error happens in any field, and in business, we might get fooled by that as well. In short, when we analyze the past we do that at hindsight. That makes us cherry pick the things that survived and assume that those carry the successful characteristics we’re looking for. For instance, for each Amazon or Google that survived there were hundreds if not thousands of companies that failed, with the same kind of “success” of characteristics of Amazon or Google. If survivorship bias is a common phenomenon, how do we avoid to fall into it? Nicholas Nassim Taleb in his book Antifragile, popularized a concept called Lindy Effect. In very simple terms the Lindy Effect states that in technology (like any other field where the object of discussion is non-perishable) things age in reverse. Thus, life expectancy rather than diminishing with age, it has a longer life expectancy. Therefore, a technology that has lived for two thousand years, it has a life expectancy of another thousand years. That is a probabilistic rule of thumb which works on averages. Thus, if a technology (say the Internet) has stayed with us for twenty years, it doesn’t mean we can expect only to live for another twenty years at least. But as the Internet has proved successful already, the Lindy Effect might not apply. In short, as we have additional information about a phenomenon the Lindy Effect might lose relevance. For instance, if I know a person is twenty, yet sick of a terminal disease, I can’t expect to use normal life expectancy tables. So I’ll have to apply that information in understanding the future. When you stumbled upon a “business formula” you can’t stop there. That business formula, if you’re lucky will allow you to succeed in the long term. Yet as more and more people will find that out, that will lose relevance. And the matter is, reality is a villain. Things work for years until they suddenly don’t work anymore. We’ll see some frameworks, but the real deal is not a framework but the inquiry process that makes us discover those frameworks. In short, the value is in the repeatable process of discovery and not in the discovery itself. A discovery once spread it loses value. There isn’t size-fits-all business playbook that you can apply to all the scenarios. Some of the business case studies we’ll see throughout this article will show companies that have dominated the tech space in the last decade and more. While the playbook executed by those companies worked for the time being. That doesn’t mean you should play according to their playbook. If at all you’ll need to figure out your own. Thus, what matters is the process behind finding your business playbook and my hope is that this guide will inspire you and give you some good ideas on how to develop your own business strategy process! We’ll look now at a few case studies, of companies that at the time of this writing are playing an important role in the business world. We derive revenue from our four business segments: core commerce, cloud computing, digital media and entertainment, and innovation initiatives and others. We derive most of our revenue from our core commerce segment, which accounted for 85% of our total revenue in fiscal year 2017, while cloud computing, digital media and entertainment, and innovation initiatives and others contributed 4%, 9% and 2%, respectively. We derive a substantial majority of our core commerce revenue from online marketing services. Alibaba, like Amazon, became “everything store” in China. It leveraged on its success to build also other media platforms (Youku Todou and UCWeb). The e-commerce, marketplace business model has become quite common since the dawn of the web. From that business models tech giants like Amazon, eBay and Alibaba have raised. For that vision to be executed it has three major stakeholders: users, consumers and merchants. The focus on the “at least 102 years” might seem fluffy words, yet those are important as this kind of goal helps you keep a long-term vision while executing short-term plans. It isn’t unusual for founders to set such visions, as they help keep the company on track in the long-run. And this is where a business strategy starts. All the business models designed by Alibaba will follow its vision, mission and the values they aim to create in the long-run. Network effects are a critical ingredient for marketplaces success. To give you an idea, the more buyers join the platform, the more Alibaba recommendation engine will be able to suggest relevant items to buy for others customers, and at the same time the more merchants will join in, given the larger and larger business opportunities. Keeping these network effects going is a vital element of long-term success but also among the greatest challenge of any marketplace that wants to be relevant. Even though Alibaba’s essence is in online commerce, the company has several business models running and a business strategy that at its core is evolving quickly. Thus, the core commerce has made it possible for Alibaba to build a whole new set of “companies within a company.” From digital entertainment and media, logistics services, payment, and financial services and cloud services with Alibaba Cloud. Thus, from a successful existing online business model, Alibaba has expanded in many other areas. And its future business strategy focuses on developing, nurturing and growing its ecosystem. From that value proposition, Alibaba has been able to grow its customer base and offer wider and broader products, until it expanded in the service and cloud business. Started in 1994 as a bookstore, Amazon soon expanded and became the everything store. While the company core business model is based on its online store. Amazon launched its physical stores, which generated already over five billion dollars in revenues in 2017. Amazon Prime (a subscription service) also plays a crucial role in Amazon overall business model, as it makes customers spend more and being more loyal to the platform. Besides, the company also has its cloud infrastructure called AWS, which is a world leader and a business with high margins. Amazon also has an advertising business worth a few billion dollars. Thus, Amazon business model mix looks like many companies in one. Amazon measures its success via a customer experience obsession, lowering prices, stable tech infrastructure, and free cash flow generation. Therefore, even though in the minds of most people Amazon is the “everything store” in reality, its revenue generation shows us that it has become a way more complex organizations, that also has a good chunk of advertising revenue and third-party services. Amazon has been widely investing in its technological infrastructure since the 2000s, which eventually turned like a key component of its business model. In this case, Amazon‘s mission also sounds as a vision statement. Whatever you want to call it, this input is what makes a company look for long-term goals that keep them on track. Of course, that doesn’t mean a well-crafted vision and mission statement is all that matter for business success. Yet, it is what keeps you going when things seem to go awry. Amazon moved from an online book store to the A-to-Z store it kept its mission almost intact while scaling up. It is interesting to notice how businesses evolve based on their commercial ability to scale up. When Amazon started up as a bookstore, it made sense for several reasons, that spanned from logistics to pricing modes and industry specifics. This isn’t a size-fits-all strategy. Amazon chose rapid growth, similar to a blitzscaling process as aggressive growth was a way to preserve itself. Hadn’t Amazon grown so quickly, it could have been killed. The opposite approach to this kind of strategy is a bootstrapped business, which is profitable right away and self-sustainable. Before we move forward, I want to highlight a few key elements to have a deeper understanding of both Amazon and Alibaba business models and their strategy. Before digitalization would show its use and commercial viability, most of the value creation processed were internalized. That meant companies had to employ massive resources to generate value along that chain. That changed when digitalization allowed the value creation process to be distributed, and we moved from centralized to grassroots content creation. This is even clearer in the case of platforms, and marketplaces like Amazon and Alibaba. For instance, where in the past the review process and quality insurance would be done centrally by making sure that the supply complied with the company’s quality guidelines. By introducing distributed review systems, where the end users checked against the quality compliance, allowed companies like Alibaba and Amazon to generate network effects, where the more users enriched the platforms with those reviews the more the platform could become valuable. For that matter though, the main platform role will be to fight spam and attempt to trick the system. Other than that (fighting spam is a challenging task) all the rest is managed at the decentralized level, and the value creation happens when more and more users review products and services on those platforms. We’re referring here to the review system, but it applies almost to any aspect of a platform. Amazon for years allowed third-party to feature their stores on Amazon‘s platform, while they kept the inventory. This meant an outsourced and distributed inventory system, spread across the supply side. Therefore, the supply side not only made the platform more valuable by creating compelling offerings. But it also made it more valuable from the operational standpoint, by allowing a better inventory system, which could be turned quickly. Therefore, the critical aspect to understand in the digital era is the decentralized value creation, which makes the value creation process less expensive for an organization, more valuable to its end users, and more scalable as it benefits from network effects. This implies a paradigm shift. When you start thinking in terms of platforms, no longer you’ll need a plethora of people taking care of each aspect of it. Rather you’ll need to understand how the value creation can be outsourced to a community of people and make sure the platform is on top of its game in a few aspects. For instance, Amazon and Alibaba have to make sure their review system isn’t gamed. Airbnb has to make sure to be able to guarantee safety in the interactions from host to guests and vice-versa. Quora has to make sure to keep its question machine to keep generating relevant questions for users to answer (the supply-side). If you grasp this element of a platform, you’re on a good track to understanding how to build a successful platform or marketplace. Apple sells its products and resells third-party products in most of its major markets directly to consumers and small and mid-sized businesses through its retail and online stores and its direct sales force. The Company also employs a variety of indirect distribution channels, such as third-party cellular network carriers, wholesalers, retailers, and value-added resellers. During 2017, the Company’s net sales through its direct and indirect distribution channels accounted for 28% and 72%, respectively, of total net sales. In short, Apple can sell iPhone at a premium price because it employes a reversed razor and blade strategy. This strategy implies free access to the Apple’s Ecosystem (ex. iTunes, and Apple Store). That makes the whole experience through Apple’s devices extremely valuable. Thanks to that experience, the perception of a high-end (luxury-like) products, together with a reliable distribution, justifies Apple’s premium prices. By the end of 2018 and the beginning of 2019, Apple experienced a slower cycle of sales for its main product: the iPhone. The company also announced it would stop reporting the number of units sold as a key metric in its financial statements. This is a significant change. Due to this slow iPhone sale in the last quarter of 2018, publications and people around the world have started to declare the fall of Apple. True, Apple is highly reliant on its iPhone. However, the whole smartphone market might be stagnating in the coming years. Therefore, Apple’s future success can’t be measured with the same lenses of the last decade. The real question is: what product Apple will be able to launch successfully? And keep in mind, it’s not just about the product. Apple’s formula summarized above can be replicated over and over again. But it isn’t a simple formula. And as locked-in ecosystems, in which Apple controls as much as possible the experience of its users have proved quite successful in the last decade. That might not be so in the next, given the rise of more decentralized infrastructure. As Apple has relied on home runs with its products, from the new Mac to the iPod, iPhone, and iPhones, that kind of success isn’t easy to replicate, and it makes the company relies on a continuous stream of fresh sales to keep the business growing. A service business would balance things out. When Apple introduced the iPhone, it isn’t like it was an overnight success. It was successful, but it had to create a whole ecosystem to make of the iPhone a continuous source of growth for the company! The Company is committed to bringing the best user experience to its customers through its innovative hardware, software and services. The Company’s business strategy leverages its unique ability to design and develop its own operating systems, hardware, application software and services to provide its customers products and solutions with innovative design, superior ease-of-use and seamless integration. As part of its strategy, the Company continues to expand its platform for the discovery and delivery of digital content and applications through its Digital Content and Services, which allows customers to discover and download or stream digital content, iOS, Mac, Apple Watch and Apple TV applications, and books through either a Mac or Windows personal computer or through iPhone, iPad and iPod touch® devices (“iOS devices”), Apple TV, Apple Watch and HomePod. Once again, it isn’t anymore about creating a product, but about generating self-serve ecosystems. How do you support those ecosystems? It depends what’s your target. A media company will primarily need an ecosystem made of content creators (take Quora or Facebook or YouTube). The Company also supports a community for the development of third-party software and hardware products and digital content that complement the Company’s offerings. The Company believes a high-quality buying experience with knowledgeable salespersons who can convey the value of the Company’s products and services greatly enhances its ability to attract and retain customers.Therefore, the Company’s strategy also includes building and expanding its own retail and online stores and its third-party distribution network to effectively reach more customers and provide them with a high-quality sales and post-sales support experience.The Company believes ongoing investment in research and development (“R&D”), marketing and advertising is critical to the development and sale of innovative products, services and technologies. As a peer to peer network, Airbnb allows individuals to rent from private owners for a fee. Airbnb charges guests a service fee between 5% and 15% of the reservation subtotal; While the commission from hosts is generally 3%. Airbnb also charges hosts who offer experiences a 20% service fee on the total price. The digitalization happened in the last two decades has facilitated the creation of peer to peer platforms which business models disrupted the hospitality model that was created in the previous century by hotel chains like Marriott, Holiday Inn, and Hilton. Airbnb is quickly branching out toward offering more experiences. We can call Airbnb the “marketplace of experiences.” In short, just like Amazon started from books, Airbnb has started from house-sharing. But that is the starting point, that gives the innovative company enough traction to validate their whole business model and expand to other areas. The principal aim of Airbnb is to control the whole experience for its users. This means creating an end-to-end travel experience that embraces the entire process. Thus, it’s not surprising if we’ll see Airbnb expanding its marketplace to more and more areas. This is also shown by the fact that Airbnb might soon offer bundled travel packages. Just as we’ve seen in the case of Alibaba and Amazon, Airbnb follows a marketplace logic, where it needs to make the interactions between its key users (hosts and guests) as smooth as possible, with an emphasis on safety. As a platform, Airbnb used initially a strategy of improving the quality of its supply by employing freelance photographers that could take pictures of hosts homes. This, in turn, made those homes more interesting for guests, as they could appreciate more those homes. As many people in real estate might know, the quality of the pictures is critical. Although this might sound trivial, this is what improved Airbnb supply side. Indeed with better and professionally taken images, Airbnb improved its reach via search engines (yes, search engines are thirsty of fresh and original content, images comprised). And it enhanced the experience of its potential customers. Baidu has an overall search market share of 73.8% of the Chinese market. Other sources of revenues comprise membership services of iQIYI (an innovative market-leading online entertainment service provider in China) and financial services. At first sight, Baidu might seem the mirror image of Google, but in China. However, this is a superficial view. While Baidu has followed in China a similar path of Google, and it did take advantage of the fact that Google wasn’t available there, to build its dominant position. Baidu also has a more efficient cost structure than Google. It had also introduced innovations in its search products (like voice search devices for kids) at a time when Google wasn’t there yet. Understanding how the value proposition for each player comes together is critical to understand the business decisions a company like Baidu makes over time. For instance, as Baidu (like Google) moves more and more toward AI, the need to balance the value proposition for Baidu Union Members might fickle. Booking Holdings is the company the controls six main brands that comprise Booking.com, priceline.com, KAYAK, agoda.com, Rentalcars.com, and OpenTable. Over 76% of the company revenues in 2017 came primarily via travel reservations commissions and travel insurance fees. Almost 17% came from merchant fees, and the remaining revenues came from advertising earned via KAYAK. As a distribution strategy, the company spent over $4.5 billion in performance-based and brand advertising. DuckDuckGo makes money in two simple ways: Advertising and Affiliate Marketing. Advertising is shown based on the keywords typed into the search box. Affiliate revenues come from Amazon and eBay affiliate programs. When users buy after getting on those sites through DuckDuckGo the company collects a small commission. It is important to remark that DuckDuckGo is still figuring out a business model that can make it sustainable in the long-term. Indeed, the company got a venture round of $10 million back in August 2018. As of 2017, over ninety billion dollars, which consisted of 86% of Google’s revenues came from advertising networks. The remaining fraction (about 13%) came from Apps, Google Cloud, and Hardware. While a bit more than 1% came from bets like Access, Calico, CapitalG, GV, Nest, Verily, Waymo and X.
Google business model is changing over the years. Even though advertising is still its cash cow, Google has been diversifying its revenues in other areas. While in 2015 90% of Google revenues came from advertising, in 2017, advertising revenues represented 86%. Other revenues grew from about 10% in 2015 to almost 13% in 2017. Many companies get comfortable doing what they have always done, making only incremental changes. This incrementalism leads to irrelevance over time, especially in technology, where change tends to be revolutionary, not evolutionary. People thought we were crazy when we acquired YouTube and Android and when we launched Chrome, but those efforts have matured into major platforms for digital video and mobile devices and a safer, popular browser. We continue to look toward the future and continue to invest for the long-term. As we said in the original founders’ letter, we will not shy away from high-risk, high-reward projects that we believe in because they are the key to our long-term success. Understanding the moonshot approach to business is critical to understand where Google (now Alphabet) got where it is today, and where it’s headed next. Understanding where Google is going next, you need to look at the AI Economy, in which the tech giant is trying to lead the pack. Whether or not it will be successful will highly depend on its ability to keep creating successful ecosystems, just like Google has done with Google Maps (you might not realize but Google Maps powers up quite a large number of applications) and Android. KaiOS is a mobile operating system built on the ashes of the discontinued Mozilla OS. Indeed, KaiOS has developed a robust standalone mobile operating system that turns feature phones (so-called “dumb phones”) into smartphones-like phones. As feature phones powered by KaiOS have access to mobile apps, connectivity and voice search. KaiOS feature phone business model wants to bring connectivity and the digital revolution to those developing countries (like India and Africa) that have missed out on the smartphone wave due to too high costs of those devices. Besides, KaiOS might be well suited for the IoT revolution! Those other bets made “just” $595 million to Google in 2018. This represented a 0.4% of Google‘s overall revenues, compared to the over $136 billion coming from the other segments. I hope that in this guide you learned the critical aspects related to business strategy, with an emphasis on the entrepreneurial world. If business strategy would only be an academic discipline disjoined from reality, that would still be an interesting domain, yet purely speculative. However, as a business strategy can be used as a useful tool to leverage on to build companies, hopefully, this guide will help you out in navigating through the seemingly noisy and confusing business world, dominated by technology. As a last but critical caveat, there isn’t a single way toward building a successful business. And often times the way you choose to build a business is really up to you, how you want to impact a community of people and your vision for the future!